← CSA Week Four, Greens Galore! Day trips on weekdays out of season are one of the pleasures of retirement. 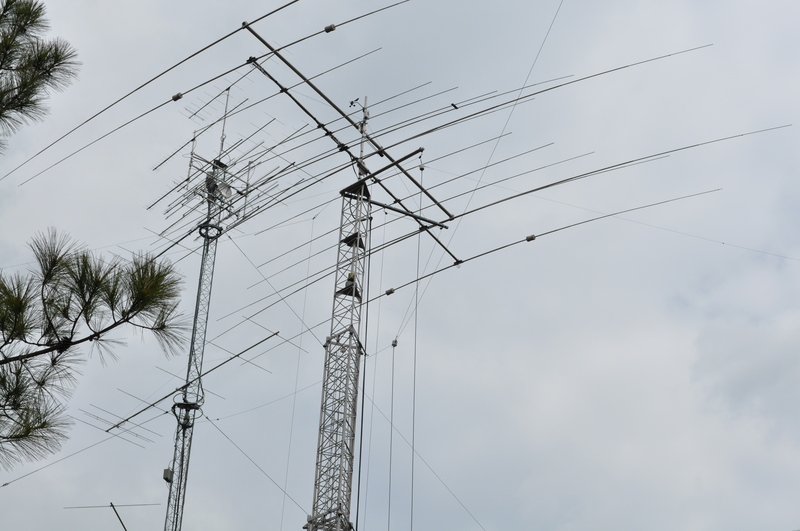 Today we had plans to check out a fairly local “hams” set up to see options for my husband’s towers and shack. But, to appease me, we added a lunch stop and a winery visit, a new one for me to add to my Sixty@sixty list. First, lunch. At a local deli, Big Al’s Market, in St. Michael’s. 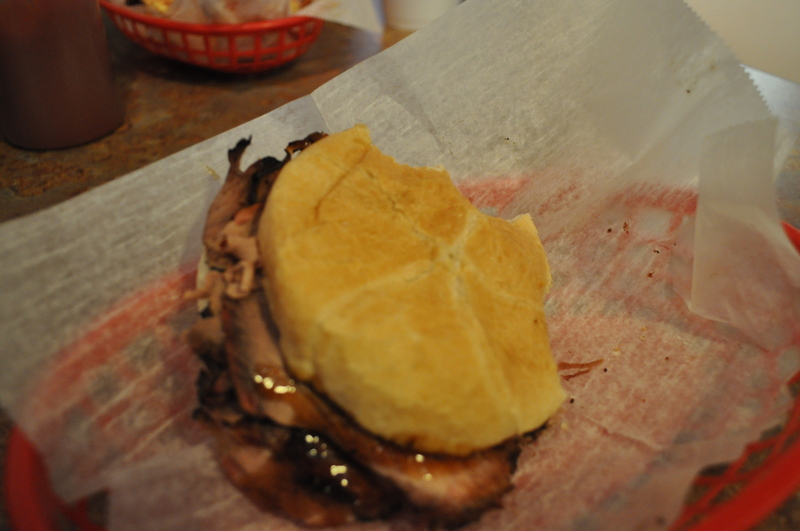 Sometimes it’s nice to be bad and eat sinfully delicious pit beef smoked that day. Right out on the sidewalk. You also know it’s good food when the sheriff’s car and a police car are there for their pick up of lunch. 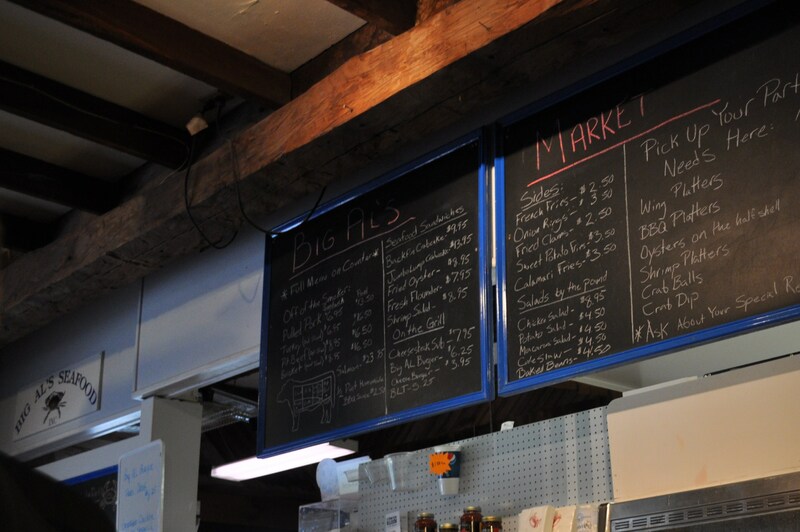 Fresh seafood, caught off Tilghman Island and brought in daily, sold for take home, or eat there. Beef, pork, brisket, turkey, all smoked. Oyster sandwiches. Shrimp salad. All sorts of crab accessories for sale, too. 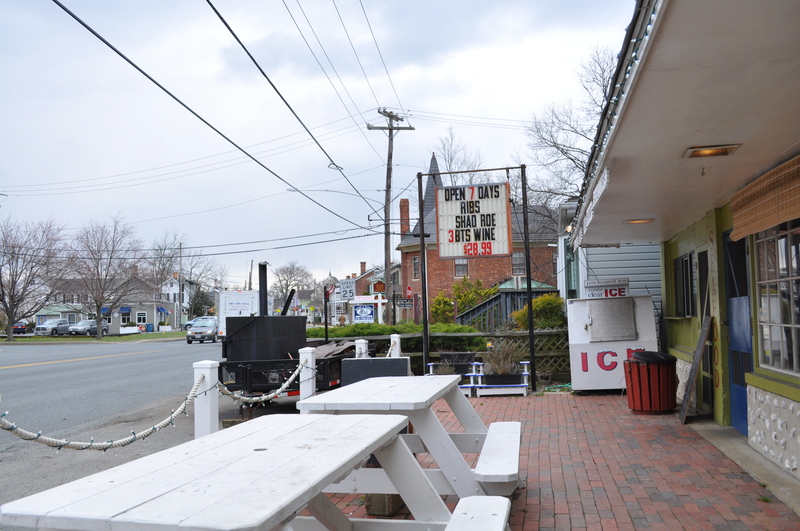 The outside, with picnic tables. There are four tables inside too. They also said they had smoked salmon for sale. We should have brought a cooler and I would have been taking home local seafood from the market in the rear. Summertime, they do crabs daily too. From there we wandered up Talbot St. to St. Michael’s Winery, in business since 2005, and now growing many vinifera and hybrid grapes on the Eastern shore. Nice crisp white wines. We bought a couple (OK, three) bottles. Nice selection. Cozy little tasting room. Must be crazy during high season on the shore. I can do without the cute names, but the oaked chardonnay was a pleasant surprise. I first heard of this winery when one of my employees gave me a bottle of their chocolate zinfandel, a sweet red dessert wine good to pour over dessert cakes or ice cream. They told us they buy the zin grapes from Rhode Island. Last stop, the ham shack up the road. My husband was suitably impressed with the towers and the shed converted to a shack. Surrounded by pine trees and right off the creek, great location for amateur radio. All in all, a nice eight hour road trip. A couple of hours down and back and four hours to wander around and make the visit. St. Michael’s is a lovely destination convenient to us, and on the way to the ocean resorts. I see more road trips this spring and summer, and for me, those road trips will almost always include looking for local mom and pop restaurants, or markets. What could be better if you wanted Maryland seafood and Maryland wine? 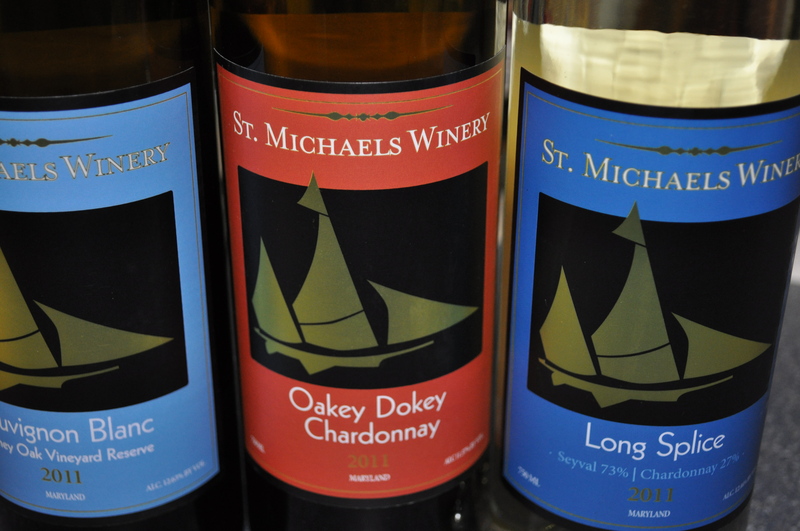 If you want to try St. Michael’s wine, they regularly attend Columbia’s Wine in the Woods, coming up in May. Posted in Day Trips, Food, Locavore, Real Food, Restaurants, Retirement, Sixty@Sixty, Wine and tagged amateur radio, day trips, Food, foodie, Locavore, real food, retirement, wine. Bookmark the permalink. Thanks! I was looking for a road trip to take my sweetie on next month for his birthday. Looks like we are gonna be hitting up Al’s! April should still be less crowded in St. Michael’s as it really is insane in the summer. Big Al’s is only open during the day. Great lunch spot.